Sorry I've been MIA lately. It's just one of those stressful times again. Did you know that once you finish your college applications you aren't actually done with tireless applications? Because you have to fill out scholarship forms so you can actually pay for higher education...sorry for ranting. I'm done now. 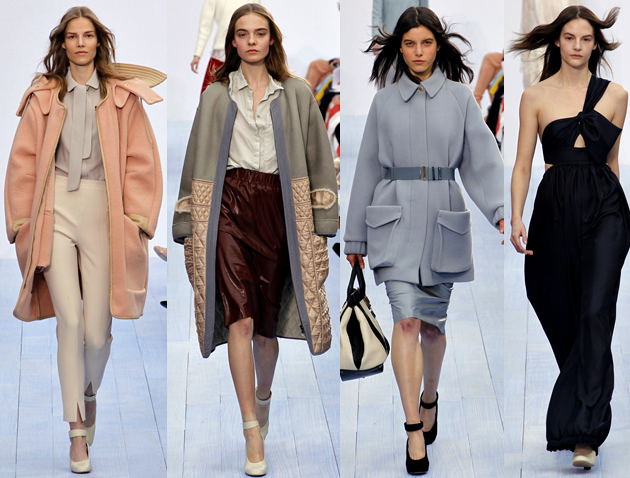 Of course, if there's anything that can brighten my day, it's the beautiful shows of fall fashion week! I was delighted to see designers are back to having fun. Fall doesn't just mean black anymore. Colors are abundant, just in rich autumnal hues. Geometric prints will dominate stores come fall, as seen at Prada and Rochas. With the stunning success of The Artist and the upcoming The Great Gatsby redux, the twenties will once again be the golden era. 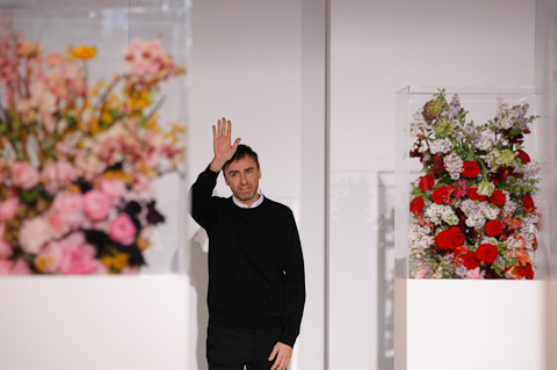 There were tears at Jil Sander when Raf Simons announced his departure, and applause at both Louis Vuitton and Marc Jacobs shows for the absolutely stunning sets. And, for the first time in maybe all of history, Karl Lagerfeld added some color to his usual black and white ensemble. Here they are, my personal favorite moments of all the fashion weeks. Carven is one of those brands that always woos the twenty-something girl desperate for a dose of French chic because they make clothes that celebrate the fun of fashion. Once a girl passes the middle school threshold, it is officially acceptable to dress like a four-year-old again, and Carven totally gets this cutesy little girl style without losing any cool. The high collars and stiff cuffs are innocent enough, but the plunging necklines and cut-out shirts are anything but. Every girl's dream. 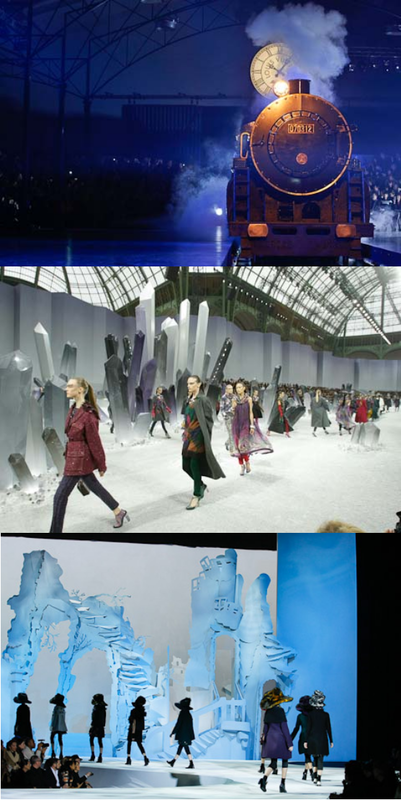 Fashion shows have evolved in the past few years. The internet has given them an unprecedented instantaneous, and now you don't even have to be part of the sartorial aristocracy to enjoy shows as they happen. Due to the widespread publicity of fashion shows these days, designers have revolutionized shows so that they are not just boring catwalks but full-on Broadway-worthy productions. The more elaborate the stage, the better. Marc Jacobs and Karl Lagerfeld have managed to master this art of stage decoration, but many other designers are hopping on the stage production (no pun intended, Marc Jacobs) train. While some argue that the costs of these shows is highly excessive, the artistic side of me feels that these sets add a whole new level to the ideas of a collection. Moschino Cheap & Chic has been one of my favorite diffusion brands for a while, because the brand captures all the energy of it's parent, but with the youthfulness that attracts a younger, more colorful crowd. So it seemed perfectly natural for Cheap & Chic to move to London Fashion Week, where neon and cheeky prints are everyday fare. The brand succeeded in capturing the heart of its new city, as the collection got stellar reviews. Katy Perry has already been seen sporting a look from the collection only days after it showed, if that is any indication of the line's success. That's right, I just Kardashian-ized the word color, or should I say, Karl-ized? But seriously, was anyone else as shocked as I was to see Uncle K don blue and purple, two colors that are not black nor white!? The problem with Chloe and I, I've recently figured out, is that the first collection I really ever noticed of Chloe's was the Spring 2007 show, which was decidedly ornate for Chloe, and because I've only recently really understood the more minimalist side of fashion, Chloe has long since been a favorite of mine. When I scanned through the Fall 2012 show, however, I was instantly delighted to see that I truly enjoyed what Clair Waight Keller put out for her second collection for the brand. The soft colors and mixed proportions were absolutely lovely. Of course, it was the twisted one-shoulder gown at the end that really did me in. The Jil Sander show was, as it has been for several years now, one of the strongest of the season, and I personally was so delighted with the pale pinks and fifties silhouettes that I was promptly devastated when I heard the news that Raf Simons, the man behind Jil Sander for the past seven years, was leaving the brand. The plot thickens: Raf is now fending off rumors left and right that he will be the new creative director at Dior, and many insiders are speculating that Jil herself may be returning to her namesake brand. Raf will be missed, but we know he's going to do tremendously well wherever he goes. So you may be asking 'Lindsey, what was your favorite show of the season?' Well, wonderful blog reader, I cannot say quite yet. These things take time. I've certainly fallen in love with many new dresses, but collections as a whole? Usually I hate Miu Miu now and then by the time Fall comes around I'm worshiping at Miuccia's feet, so we'll have to wait and see as we draw closer and closer to fall. 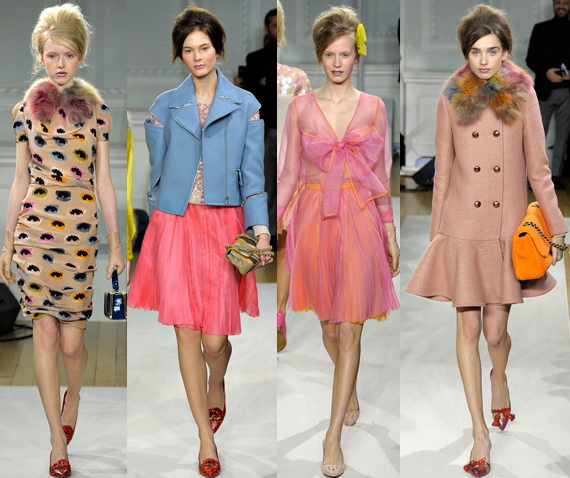 Oh, how strange the fashion world is, that spring has not even officially started yet and still I'm yearning for one of Cheap & Chic's technicolor furs?